The writing was on the wall. No contract nailed down for Nick Powell and Will Grigg out of favour with the manager. Given the situation has been festering for weeks it is no surprise to hear the media telling us that Powell will soon be off for Glasgow and Grigg to Sunderland. Over the summer we were nervous about Wigan Athletic selling off their prized assets. In terms of market transfer value, the trio of Dan Burn, Will Grigg and Nick Powell were head and shoulders above the rest. It was a relief when the summer transfer window closed and only one of those assets was sold. The sale of Burn to Brighton for around £3m helped underpin the signings of Cedric Kipre (around £1m), Leonardo Da Silva Lopes (around £800,000), Joe Garner (around £1.2m) and Josh Windass (around £2m). The Powell and Grigg transfers would bring in around £3.5m. Should they leave – and we expect they will – what effect would it have on the team’s ability to stay in the Championship division? Latics started the season utilising players who were the backbone of the League 1 title winning team. The loss of Dan Burn and Nathan Byrne through injury meant that the 21-year-old Cedric Kipre and the 18-year-old Reece James were drafted into the defence. 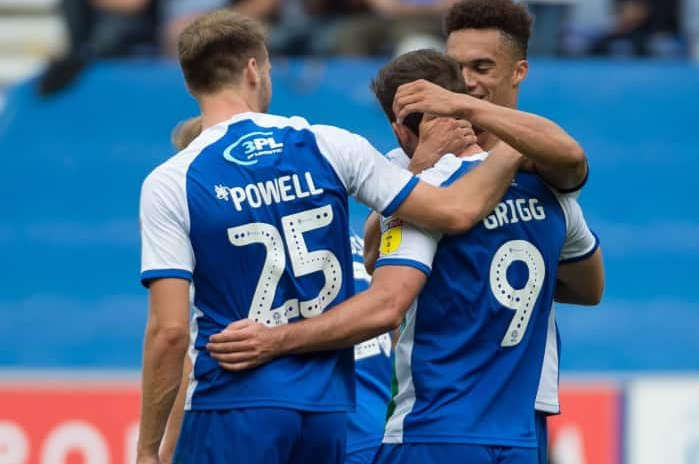 Nevertheless, the starting lineup in the first game of the season against Sheffield Wednesday still contained seven of last season’s regulars: Christian Walton, Chey Dunkley, Sam Morsy, Gavin Massey, Michael Jacobs, Nick Powell and Will Grigg. The early season form was promising, built around the mutual understanding between those players whose confidence was high following their previous successes in League 1. However, as time went injuries took five of those seven out of the equation for periods of months. The front four of Massey, Powell, Jacobs and Grigg had combined so well the previous season and looked like they were going to continue to show that positive chemistry in a higher division. But the last time that quartet was to play together was at Stoke in late August. Since those early days of the season when Wigan were so enjoyable to watch the quality of football has plummeted. The team has lacked creativity and a cutting edge. The smooth attacking football has only returned on occasions, the norm being a so-called “direct” approach. Nevertheless, even then chances have been created but the finishing touch has not been there. Some would say that had not Cook not left his best goalscorer, Will Grigg, so often on the bench, more points would have been picked up. Grigg has made only 10 starts in the 28 league games this season. When asked why the player with the best career goalscoring record has been so consistently omitted Cook retorted that it was because his supply line of Jacobs, Massey and Powell had been injured. The bizarre response of the manager is of concern to those of us who prefer an emphasis on a creative approach. Largely through the assistance of that supply line Grigg scored 26 goals in 53 appearances last season, but is that to suggest that he cannot score goals without them? His career record shows that he can. The debate continues among fans whether Will Grigg is a Championship-level striker. The last time he was there in 2016-17 he scored 7 goals in 38 appearances. In both that season and this he has had niggling injuries that have impeded his progress. Some critics will say that the pressure of playing against higher quality defenders has led to those injuries. Grigg is an intelligent footballer. He knows how to run into space, timing his runs adeptly to stay onside. He showed his quality against Premier League opposition in the FA Cup last season. His strike against Manchester City will be etched in the memories of Latics fans for year to come. But Grigg also scored at Bournemouth and got two against West Ham. When Wigan resort to a long-ball approach he has tended to be less effective. But so have the other strikers who have competed with Grigg for his place. In fact, so many of the long balls launched from defence have been of low quality, leaving an unsupported central striker a hopeless task of evading two big central defenders. Nick Powell’s last appearance was on November 28 against Blackburn Rovers. It could be the last he played for Latics. We have waited since summer to hear news of an extension of his contract, but nothing has resulted. Have the player’s wage demands been beyond what the club is willing to pay? Or are they unwilling to commit to a long-term contract on a salary well above Wigan norms for someone who has had major injury problems over recent years? If he leaves Powell will be sorely missed. He has been the orchestrator behind the best football the team has played in the past eighteen months, a virtually irreplaceable asset. However, his contract runs out in summer when he can leave as a free agent. Media reports suggests that both Celtic and Rangers are keen to sign him before the transfer window closes in a week’s time. Latics will press for realistic prices if they are to let both Grigg and Powell leave. Rumour has it that they will push for £1m for Grigg and £2.7m for Powell. Should the transfers go ahead what proportion of any incoming funds would be invested in new players? Moreover, will the club’s recruitment be more effective than it was in summer? Up to this point Latics have signed only one player in the January window, free agent Anthony Pilkington. With the departures of Dan Burn and Alex Bruce Latics certainly need cover in the centre of defence. They also need someone who can play left back with Antonee Robinson still injured. Reports tell us that they have offered Reading £450,000 for Tyler Blackett and Nottingham Forest £200,000 for Danny Fox. Both can play at left back or in central defence. They are also interested in free agent Alex Milosevic, a Swedish international central defender. Defensive reinforcements will be brought in, but the big question is what is going to happen to the quality of football if Grigg and Powell are released?